Winchester is a lovely city ( though it’s really more of a large village in many respects ). It’s a walking city, with much to see, by way of beautiful old buildings and the remnants of a medieval past, but you need to be on foot to really appreciate it. Unfortunately, when I spent a day there earlier this week, it was pouring down, so my walking was somewhat curtailed. 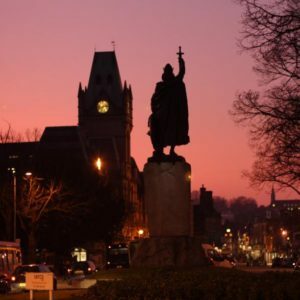 A major city of Saxon England, it was home to Alfred the Great, whose statue stands outside the Guildhall (below left) . 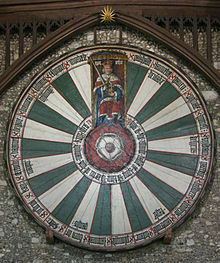 It also claims a version of King Arthur’s Round Table, see right, though more of that later. 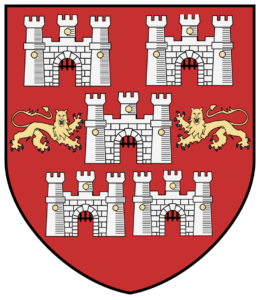 It’s coat of arms is five castles and two lions on a red background ( or, in heraldic language, five Castles triple-towered in saltire argent, masoned proper and on either side of the castle in fess point a Lion passant guardant in gold ). Coincidentally, these are the very items which feature on the arms and banners of Alfonso as King of Castile y Leon, though drawn somewhat differently. Castles and lions have, I guess, always been popular heraldic emblems. 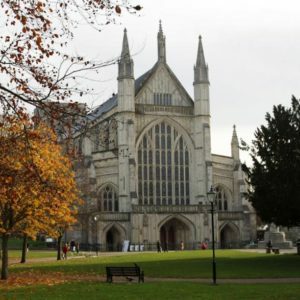 Winchester is also a literary city. It is widely supposed to be the model for Barchester, in Trollope’s Barsetshire novels and Trollope certainly went to school there, attending Winchester College. ‘The Warden‘ is supposedly based on a scandal at the Hospital of St Cross. The town also appears as Wintonchester in Hardy’s ‘Tess of the D’Urbevilles‘ and Winchester Cathedral is the setting for scenes from Thackeray. More than one Sherlock Holmes story is set in or near the town. Jane Austen is buried there. More recently Winchester appears in Bernard Cornwell’s Saxon tales and novels by Ken Follett, Patrick Gale and John Christopher and, more bizarrely, as the birthplace of Captain Scarlet in the old Gerry Anderson puppet series, which I remember from childhood, ‘Captain Scarlet and the Mysterons‘. On Wednesday evening, however, I was at Winchester University for the final lecture in the Summer ‘Royal Blood’ series, sponsored jointly by the University and the Hampshire C ultural Trust. The lecture was entitled ‘The Interwoven Lives of Two Spanish Siblings’ and it focused on Alfonso X of Castile y Leon, whom readers will know from ‘Reconquista‘ and Eleanor, or Leonor, of Castile, his half-sister and wife to Edward Plantagenet, King Edward I of England. The lecturers were Professor Simon Doubleday of Hofstra University, author of ‘The Wise King‘ and Sara Cockerill, author of ‘Eleanor of Castile‘. Alfonso was a major influence on the young Leonor, even though she was the product of his father’s second marriage ( and Alfonso was most attached to his mother ). He encouraged her schooling and learning and it was he who arranged her marriage to Edward when Edward was heir to the English throne. The marriage, despite being arranged to settle a dynastic dispute, seems to have been a happy one. Edward was so distraught when his beloved queen died, at Lincoln, that he had her body brought back to London and, in every place where ‘she’ rested over night on that journey, he built a Holy Cross. The building of the ‘Eleanor Crosses’ was almost the only thing I knew about Leonor before attending this lecture. But I learned that she is almost as fascinating as her half-brother. She was a woman hardy of body – she spent most of her marriage to Edward either pregnant or having just given birth and produced sixteen children, most of whom died. And hardy of mind – she, personally, built up and administered a large property portfolio, including Leeds Castle in Kent. She accompanied her husband to war, even on Crusade, encouraged literature, created or had created many gardens and brought an Iberian sensibility and style to the English court. It was a shame that I was prevented by rain from going to see one of the gardens, I will do so next time I visit Winchester. And the round table? Well, Leonor was very fond of the Arthurian legend. The idea of ‘right over might’ so prevalent in Arthurian literature or, put more prosaically, the establishment of the rule of law, is one which resonated in the Middle Ages, as did the idea of the ‘ideal King’. King Alfonso and his Siete partidas are concrete examples of a monarch trying to live up to the ideal and developing ideas of governance and law, as well as behaviour and philosophy. This ideal still resonates today, even in our democracies, which, in part, explains the continuing popularity of the Arthurian fiction. The Table, alas, is of a much later provenance than the myth – 13th century, which is co-incidental with Leonor. Hmmmm. Maybe that’s another story altogether. I almost attached the theme song to ‘Captain Scarlet and the Mysterons‘ here, but resisted. Just. This entry was posted in History, Publications, Writing and tagged History, Writing & publishing by juliej. Bookmark the permalink.